Ridgway Potteries Ltd was founded possibly around 1744 in Staffordshire (the exact date is hidden in the mist of time), by Ralph Ridgway - (see also Colclough China). But what on earth happened to a once legendary name? It’s a shame that once ascendant names in the world of fine bone china like Ridgway fizzle out and lose their magnitude. 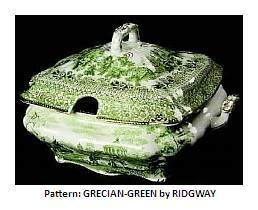 Ridgway Potteries had a celebrated history. You can trace the Ridgway family name way back. Back to the very earliest days of the Staffordshire potteries, there were influential families of potters - like the Adams, Ridgway and Wedgwood names. In the 1800’s William and John took over the Cauldon Works, founded by their father Job Ridgway in 1802. John, taking the Cauldon works while William went his own way with the Bell works inherited from uncle George. John Ridgway, was appointed Potter to Her Majesty Queen Victoria, earning a high commendation at the 1851 Exhibition. You can’t get better acclaim than that as a potter. The 1851 exhibition catalogue says Ridgway Potteries Ltd was: 'One of the largest and among the best conducted of the many factories of Staffordshire'. So one of the most important and prestigious of the mid-19th Century makers. A century on, the 1950's saw the once glorious name tied into a larger, somewhat faceless group run by profit hungry group called Pearsons. This was the beginning of the end for this once great maker, in my view. When the profit hungry soulless guys take over, watch out. So with this brand look out for the older items especially. There will be lots of 1950's stuff with floral motifs - you can tell these straight away. By then Ridgway were a mass producer of nice quality but somewhat churned out wares at this time. 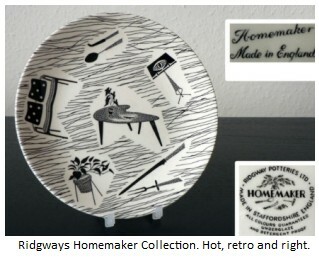 However, there are always exceptions because ranges like the (now) retro black & white 'Homemaker' collection are fab. It evokes all the 50's design values - that reaction away from the post war rationing and austerity, the Festival of Britain, optimism, British avant guard quirkiness of design, and all that. When you look at the history of successful china companies, they always have a person or persons who at one stage in the history were the movers and shakers which really got things going. Ceramic and pottery production really is Art in business, rather than business in Art, so often the kingpin of the operation has to have a real designer's head, rather than just purely financial or business. The man in this case was John Ridgeway, son of founder Job.He really was a bundle of creative energy - a designer/entrepreneur of the highest quality. A highly religious and socially responsible man, he established a School of Design and founded a scholarship which is still available today (see University of Manchester). He was, of course, bestowed the title of Potter to Queen Victoria and as early as 1815 was one of the first companies to take the lead in marketing bone china porcelain. He travelled to the US in the 1820's and established a successful export trade. One of those best export lines was the line called "Beauties of America". He also helped found, in 1855, the company that went onto evolve into the world renowned Poole Pottery. So What Happened to Ridgway After Mr John? Sadly, all the accolades afforded to Mr John Ridgway were not enough, to stop Ridgway passing into (relative) obsurity today. This came about through the lack of successors with he same quality of vision and energy. By the 1940’s Ridgway Potteries Ltd was still a big name, and had survived the great depression and World War 2, but a general slowdown in the market for fine china together with more competition and less visionary leadership, had meant the firm was preparing for a merger with another set of companies who had previously merged together making a group called the Booths & Colclough China Company. This group had various names which I write about in more detail eslewhere on the site, but are known to some commentators a the Ridgway Group of companies. Royal Doulton acquired this group in the 1960’s. And really, you could say that the once glorious firm of Ridgway Potteries Ltd had had its day. Portland (tea and dinner ware). Other china companies associated with the Ridgway Potteries Ltd in various capacities are Brown-Westhead, Moore & Co, E.W. Brain & Co. Ltd, Pountney & Co. Ltd and Booths Ltd (Booths & Colclough Ltd). For more on any of these companies go to the English manufacturers quick reference list which is on a separate page. 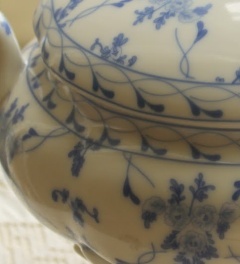 return from Ridgway Potteries Ltd to homepage or alternatively back to the antique bone china section.